Photograph by Robert Citron, courtesy of the Smithsonian Institution. 1970. In physics, there is a famous tenement that reads as, ‘cause and effect’. But, for Hekla I find that the founding principle of the Bauhaus school of modernist architecture is far better suited to express what I will be trying to model and express here. It states that the form of a building will at the end of the day follow the function of the house. The Bauhaus school boiled this concept down so that the function became prime in the design of the house. In the case of Hekla both the edifice and the magma reservoir form will follow the geologic function of the local geologic setting. I also stipulate that this is true for all volcanoes, that they are subject to form follow function. The question is more what function will yield the form. Classical volcanology utilizes two basic and highly simplified, or even stylized shapes of magma reservoirs that have been developed for volcanoes outside of Iceland. The oldest representation and most common is the magma chamber. It is obviously over simplified in its representation, it is not a simple round ball of magma sitting under a volcano, it is far more intricate and the intricacies is different for every single volcano depending on the local geologic setting. Dyke-sill model, image by Kenneth A. Bevis (2013). The second model is the dyke-sill formation where the rising magma forms tubes and sheets of magma residing in heated up bedrock. This model is often supported by tomographic mapping of magma reservoirs, these maps tend to give us weirdly shaped amorphous blobs consisting of horizontal and vertical structures located under volcanoes. The dyke-sill magma-reservoir model seems to be predominant where buoyant hot magma is forcing itself up, and the penultimate form is given by the function of the bedrock, or in other words, it follows the nooks and crannies of the rock itself utilizing every weakness it can find on its way up. To find the function of Hekla we will have to strip her down into the simplest nucleic detail. In the first article, I proposed to enlarge the volcanic nomenclature with the word stratofissure. The strato-part would obviously be the form, and the fissure-part the function. The edifice is just an afterthought, a result of the erupting Heklugjá fissure. The fissure itself is limited to the north by the fissure swarms emanating from the Bárðarbunga volcano. The Heklugjá starts where the Veiðivötn Fissure Swarm tapers off. The southern end is likewise limited by the Southern Icelandic Seismic Zone. Both the Eastern Volcanic Zone that the Veiðivötn is a part of and the SISZ are managing a lot of the Icelandic tectonic motion as Iceland spreads and in between we find the highly localized and slowly spreading Heklugjá fissure. The NE/SW-trending fissure is 7 kilometres long at the surface as evidenced during larger Hekla-eruptions when the fissure split the mountain in half lengthwise. We also know that this fissure historically has widened with an average of 4 millimetres per year. The fissure probably started in the same manner as the earthquake fractures (Sprungur) in the SISZ, through a series of large earthquakes starting at depth and slowly moving upwards. In the SISZ this will at best produce a slight amount of decompression melt magma that flows up into the new “crack” in the crust. The difference here was that due to its location, the budding Heklugjá not only received decompression melt magma, it was also located close to the mantleplume so that it could receive mantleplume derived magma that flowed on the underside of the crust. Probably funnelled by the Veiðivötn fissure towards the vicinity of Hekla. This led to fresh hot magma pooling in the “crack” as it widened over the time, and this in time led to the fissure both being kept open and becoming ever more ductile from residual heat. So far I have called the fissure a “crack”, but now we are ready to start to contemplate the form that follows the function. Spreading fissure, width not to scale. Doodle by Carl. To decide the form of Heklugjá below the edifice we need to look at more of the function. First of all, we need to understand that the central part will be spreading with the maximum available speed and that the spreading motion will diminish as we get closer to the ends due to limiting factors. This will make the fissure oval with tapering ends. In the image the width is highly exaggerated compared to the length. The width of the fissure will be constrained by the time it has been widening. It seems like the fissure initially started to form about 10 000 years ago, if this holds true the average width would be as little as 40 meters wide on average. Obviously, the bottom would be wider than the top. For obvious reasons a magma filled fissure pocket would be starting at the bottom of the crust and have spread more at the bottom, both in width and length. We have good reason to expect that Heklugjá is 15 kilometres long at the bottom. At the same time the measurable width expansion at the top is more constrained than at the bottom, we can guesstimate that the width at the bottom is between 2 and 4 times larger than the average. This would give Hekla an unusually small magma reservoir compared to older Icelandic volcanoes with a tentative size between 10 and 12 cubic kilometres. The problem is that this would mean that Hekla has the largest output of ejecta compared to magma reservoir on the planet. This in and of itself is problem that may not be solved by the model itself. An obvious solution would be if the fissure is wider and/or longer at the bottom. The function of the fissure has a snazzy name, it is a sinusoidal 3D-wedge. And the beautiful part is that it will contain its shape as it enlarges upwards powered by the spreading apart of the sides of the fissure. Form truly follows function, and it will continue to do so in the future. The fissure would have the same subsurface shape regardless of when in time we look at it, the proportions would be the same, it is just the dimensions expressed in meters that would increase over time. The picture contains a bit of weird mathematical squiggles, I will return to them in the final instalment where I will describe the future and the end of Hekla. All theoretical models are plain old hypothesis up until the point that they meet empirical evidence. At that point, they are either falsified and the happy go lucky theoretician will have to return to the drawing board, with his feathers ruffled. Or the empirical data will support the hypothesis, transforming it into a proper scientific theory. We can’t use GPS-data to support the hypothesis since we used that data to form the hypothesis to begin with. That would be circular reasoning that is self-proving, and that would make our dear Albert go Popperian on my shaggy head. That leaves us with seismological data as the only viable way to falsify the hypothesis. But, before we go there we need to make a logical assumption on what the earthquake data would show. Seismicity at Hekla between 1999 to 2017 giving a rough outline of a Eastern part of a flatter sinusoidal 3D wedge. Image by Andrej Flis. We do know that the crust is thick and cold on the southern end, we also know that the spreading factor is fully taken up by the SISZ here. There is also only decompression melt magma on this side since it is facing away from the mantleplume. If we look at the northern side we find slightly thinner crust due to the vicinity to the Veiðivötn fissure, there is also quite a lot of pressure induced by the input of hot mantleplume derived magma, so much so that there should be a trace in the earthquake data of the outline of the hypothesized shape. I can’t plot things, that is quite well known. In this case, I had plotted it on a draughtsman’s millimetre paper prior to starting to write this series. Thankfully everyone was saved from my hand-doodles by Andrej Flis who made a stunning set of videos and stills where he plotted the runup and eruption of 2000, and the runup to the next eruption. I find that the hypothetical model follows the empirical data well enough, with the intriguing possibility that the entire fissure is slightly tilted towards Katla, like the leaning magmatic tower of Hekla. In the next part I will discuss what the effects would be over time by a propagating fissure of this type in regards of the development and changes in eruptive style and the increase in eruptive frequency. Lots of activity this morning. Damn nice one. And thank you for including my stuff aswell. I appreciate it. What would be really spiffing is if we found a form that is hidden inside the outline of the earthquakes. That “silent” form would be the reservoir itself. The fissure being tilted towards Katla, does that indicate interactions between the two volcanoes? Perhaps to the extent where the increasing pressure in Katla can trigger the increased activity we see at Hekla now? If so, one might expect that when one of them blows, the other will return to a (fitful) slumber. Given all the things that lie between them, and the geological setting individually, I really highly doubt it. It was more of a way to give an explanation in what way it was tilting. I did not in any way imply that there is any relation at all. There are after all 3 volcanoes between them (Vatnafjöll, Tindfjallajökull and Eyjafjallajökull). Well if you look at the top down image, you can almost kinda see it, more defined towards SE/NE and cutoff towards W/NW. I need to do more visualisations and full 3D and 4D with time dimension added, before speculating too far. The fact is that most of the recorded quake data before 2011(perhaps even 80%) is from one day alone, the 2000 eruption day, where some features really shine out. But thanks to the improvements of the monitoring system, we now have much more data recorded in the past few years, and can watch in real time at the seismic patterns in the run-up to a Hekla eruption. That’s a very profound statement and something that people who haven’t studied the field don’t often think of at all. In some situations the ‘topography’ of the *base* of the crust – something as real as the topography of the surface of the crust we see around us every day, but of course entirely invisible and hard to ‘map’ – can play a crucial role in channeling buoyant magmatism – just as surface topography guides rivers and dictates the position of lakes. But yes, it is important to try to understand the topography of the bottom of the crust, it is where we can watch how volcanoes form and are interacting in all sorts of interesting ways. hold on was that a pun on ‘profound = deep’ ? so ‘top’ography not the right word, need a new word – profundography ?! Thanks for very interesting discussion!! This is a real brain-tester! An interesting paper, Carl. This is good food for thought, thank you! Could Hekla be a “postmodern” volcano? After all, the results in Iceland are a bit of a weird splodgy bump on the landscape rather than a clean, neat volcanic cone. A couple of thoughts crossed my mind while reading. Both relating to your statement Carl, that Hekla is the youngest of the Icelandic volcanoes. The first is, are there any other volcanoes of a similar age across the globe? The second is, could the older volcanoes in Iceland have started in a similar manner and exhibited similar behavior at the same age? There probably isn’t any way of answering the second question, but perhaps linked to that, is the unusual behavior possibly linked to the proximity to either the mantle plume (depending on just how large it is of course) or the junction of the various bits of the MAR? All this talk of age and behavior, makes it sound like volcanoes are alive :P.
Yes, there are indeed volcanoes of similar age, but not similar in behaviour. There are two slightly older Icelandic central volcanoes that exhibit wildly different behaviour and characteristics, namely Theistareykjarbunga and Heimaey. The only volcano that has had similar characteristics, but less violent, is the now defunct Thingmuli volcano that Iain Charmichael wrote about in his seminal paper on Icelandic petrology. In regards of your last question, I will defer answering that for now since the answer will be given more fully in a subsequent part. Deer charges for headlights, misses. I just noticed the cluster of Icelandic quakes early Monday morning. It’s almost as if Iceland sneezed. Article found in the daily mail on most dangerous volcanoes. They basically just listed 5 well known historical volcanoes, not volcanoes that are necessarily likely to be next in line as danger sources. Well, no matter what, the world’s most dangerous volcano is the one that goes missed by researchers and is in a populated area. Anecdotal stuff from people in the area, say that it feels like a buildup to something larger. In that region there is always something bigger around the corner. M5.1 is not that big for the region. This is a very dangerous region for quakes too. Right around the city San Salvadore, the largest in El Salvadore, which is sandwiched between the San Salvador volcano and Llopango caldera. [META] I don’t suppose you could add https support to this website? Looking at the history of Hekla, it started with basaltic flows after the ice age, and moved on to the dual magma composition it has now. It is indeed very young (although I guess you can’t rule out an an earlier proto-Hekla). There must be at least three different magma sources, of which one (basaltic) is no longer active or reachable. The implication is that the rift does not go down to the mantle. The composition is quite different from the volcanoes east and north, so I would expect there is no connection to the magma sources underneath Vatnajokull or even Katla. The alignment with Veidivotn comes from a shared direction of weakness, and does not imply a direct connection. Hekla is the only Icelandic volcano on the SISZ transform fault, I think, and this could well be one of the two magma sources. Friction along the transform fault may generate some of the heat. I can buy the model of the rift acting as the magma conduit and some of the magma reservoir. I think it is mainly a rift in the upper half of the crust. Of course the fact that Hekla has a central peak mans that most of the magma/lava does end up underneath there. The rest of the rift takes part in the eruption but does not form the main conduit. Whether the rift is spreading: My guess is that is essentially fixed at the southern end (where the transform fault anchors it) and the norther end, but some spreading in the centre but rather little. If you look at the map of Iceland, and draw lines ESE-WNW, i.e. along the line of spreading, you find that Hekla occupies a gap between the Katla complex and the volcanoes of the western volcanic zone. It may be that nearer the surface, there is a bit of spreading that is not well covered by either the eastern or western zone and that Hekla lies in the zone of stress caused by this. Funny beast. Why doesn’t Hekla have a glacier? I’d guess Hekla doesn’t have a glacier for a few reasons (which all might be wrong). It’s a young mountain/volcano, that has continued to grow, which means that the quite regular eruptions it has had, will have hindered any real icecover to get established. It’s about as high as Katla, not as old though, Katla will have had big chunk of ice lodged since the ice age, Katla also does seem to have more nooks and crannies that the ice can hold on to. It may be that Hekla does not have enough surface above the snow line to support a glacier. I doubt that it has bene growing so fast, as the GPS does not show significant inflation.You would need 1 meter per year, I think, and that is a lot. By growing, I was thinking more along the lines of each eruption adding more and more stuff on top trough the years. Interesting! It had a glacier 200 years ago, as seen in this painting, but it disappeared. So it managed to get itself covered in ash! Albert, Hekla is NOT the only volcano along the SISZ. The entire range of the SISZ fracture zone is filled with small volcanoes. But volcanic activity along the SISZ is mostly small sized (VEI2 or lower) and with rare frequency (one eruption every few thousand years). Most are Pleistocene and there is only one volcanic field in the Holocene, named as Grimsnes (somewhere between Hengill and Hekla, about 30km from Hengill and 50km from Hekla). In this region, which was actually my home for 4 years, there are many monogenic vents, at least of 7 eruptions, which occurred at different times in early and mid Holocene. At least two eruptions were midly explosive. Elsewhere some eruptions have been dated by tree-ring counting, formally known as ‘dendrochronology’ Dating eruptions by guano layers requires a nice respectable name Any offers? Coprochronology? I’ve wondered about Hekla not having a glacier. A couple of thoughts have crossed my mind. Curious on what you have to say about her above & below ground. She is a most difinitely unique volcano. Probably tends to eat them as they form. Actually you just gave me an impressive insight. There are abundant reports of Hekla having a small glacier/ice cap, up until 1947, the last largest eruption. Obviously, the ice cap was almost gone by then (post-industrial climate warming), and that eruption eruption took care of the rest. Could Hekla shift in eruption frequently be linked to this? Katla eruptions are possibly supressed by its ice cap and triggered when the equilibrium is disrupted (increased meltwater triggered by increased geothermal energy, lifting up the pressure). Hekla could have been behaving this way up until 1947. As the ice cap was gone, Hekla changed, with more frequent eruptions and smaller in intensity. An M2.9 at 0.5km depth at Oraefajokull worth mentioning. We have a bit of activity at Kilauea in the last couple of hours. First a 3.5 at 2.6 km and then a 2.8 at 2.4 south of the caldera. Both within around a km of each other. The second was an aftershock, I think. This is on the southwest rift zone, not on the magma path to Pu’o’o. There are also earthquakes further along the coast. I have the impression that the southern side of Mauna Loa is on the move, perhaps in response to the inflating magma chamber. You have commented that the movement at the caldera has stopped. But that just means that the magma chamber is now located off-peak: as it gets shallower, the effect is seen over a smaller area. Both Mauna Loa and Kilauea are inflating: it seems a race in who gets there first. But since Kilauea has a safety valve and Mauna Loa does not, my bet would be on the latter. Although I wouldn’t put any money on it.. I think Mauna Loa is about as “full” as it can get (especially in the summit reservoir), the amount of magma now is certainly higher than 1984, it’s hardly inflating compared to even a month ago, and seems to be creaking at the seams with this notable uptick in quakes. It surely can’t withstand much more pressure, looks to be on a hairtrigger now. I expect it to be a pretty big eruption and as we know it doesn’t give much of a final countdown. I certainly wouldn’t want to be anywhere near the upper southwest flank! As for Kilauea’s SWRZ, it’s been pooling magma for about a decade now, but unless there’s a significant change on the ERZ I don’t see an eruption breaking out there for some time. It also appears that the southern flank of Hualalai is starting to get pushed a bit too, there’s been a sprinkling of tiny quakes. I will keep watching and let you know what I see. We are hoping to get out there in July so we may have to have a plan if something does happen. I have looked in the past and I see many different GPS, tilt meters, and other monitoring devices on the big island. The HVO most likely presents us with the most important metrics to watch for Mauna Loa and Kilauea. Is there a way to watch the movement of Kilauea as it is pushed to by Mauna Loa or the movement of the areas near the ocean as Kilauea moves them towards the ocean? It would seem that we should be able to see the relative movement of a GPS station relative to a “somewhat” fixed point or in reference to a standard. I see the Icelandic observatory has vector maps of the movement of some gps stations in relation to a point in time (past) for their GPS stations. I did notice that some of the monitoring equipment does not belong to the HVO. Somewhat related question, but what are the chances of this activity affecting Mauna Kea? I’ve read that its only dormant, not extinct and that it could erupt again in the future. Unlikely in the short term. If it would erupt, it would probably form another scatter cone somewhere on its slope. There are quite a few of them. The summit is pretty safe. It better be – there is an absolute fortune in telescopes and instrumentation up there. If you’re stuck in a hole and can’t get out… It might be wise to stop digging. If their stock tanks, I don’t care. It seems they deserve it. Treating people like livestock earns bad karma. I read somewhere else that serious consideration was being given to opening up domestic routes to international carriers… that would be appropriate in my opinion. Sure, there are security issues that hae to be dealt with, but why the hell should a pathetic carrier like United be protected from competition when they treat people like feces? I don’t hold UAL stock, but I would dump it in a heartbeat if I did… and claim the capitol loss on taxes if I had one. American cabotage law is disgracefully strict. It’s even worse on the water; it’ll illegal to transport passengers or freight between US ports on a ship that wasn’t built in the USA. Ridiculous protectionism with very strong vested interests behind it. Just imagine if the same law applied to airlines and they were forbidden to operate domestic routes with aircraft that weren’t built in the USA! But, I did learn something from your comment… Thanks! If there were an underlying safety issue, the excuse might be justifiable. (double hull tankers etc) Failing that, it’s just cronyism and payoffs. As for the double hull tanker bit… Exxon Valdez comes to mind. But that was built at NASSCO in San Diego. (I watched them build it while I was stationed on a ship at Pier one at 32nd Street Station.) After they finished with Valdez, they used the same pier to do the hospital ship conversions. Pilots Asians who are building time to go home. was a way around paying wages that are competitive for major air carriers. Wages are an issue anyway. those Korean pilots, and the pilots pay the company…. A weather bomb masquerading as a Taupo eruption..
One of the most dangerous things for a landing aircraft. From what I understand, if you compensate for the headwinds, when you clear it, you have little airspeed left. Yes, I think from memory one of the more recent plane crashes was caused by one. Very sad. Which is why it’s important to continue research so earlier warnings can be given to the public. I was almost mashed into the high desert by one in a DC-7…. 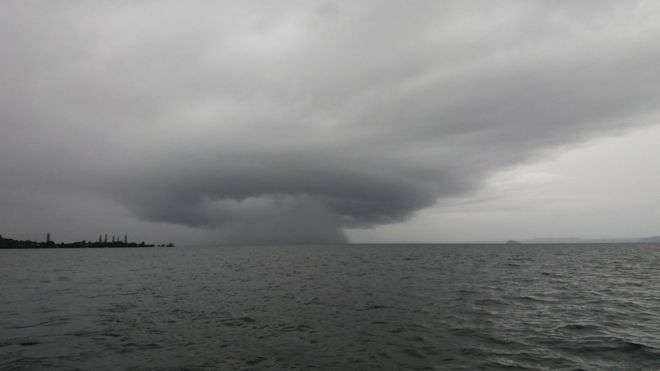 I think that this shower over Lake Taupo was a supercell. A supercell is a thunderstorm with a deep and persistent rotating updraft. Yeah, supercells can be a pain in the arse. Had a blob of high CAPE waft in off the Gulf a few years ago and spawn one in South Mississippi. It went on to split into about three systems as it rolled north. As one passed where I was at it dropped a cluster of tornadoes that tore stuff up pretty good. We were out counting downed trees afterwards and had more trees than we had holes in the ground. Pretty wild. The somewhat ominous bit is that a Church about seven miles away had more holes than they did trees. Interesting! Filling up her pot from below? And another wee shake 2.7km under Hekla. I’ve noticed this same spot rattles from time to time. I wonder what it represents? I did not realise Google Maps allows you to “walk” up Etna! Here’s a view: https://goo.gl/maps/8YyaEvkjNWz . They sent one of their trekkers all the way up the paths to near the summit. It appears inactive on the day of the climb.